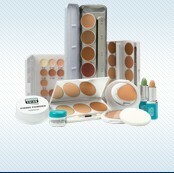 The PRO CARD Loyalty Program grants professional make-up artists with discounts at all participating PRO CARD stores. Discounts between countries may vary. In addition to highly competent professional advice, you can expect an even more privileged and pleasant shopping experience. The PRO CARD is free for the first year. If you purchase products and/or services in the Euro-Zone to the value of € 1000, in the UK £ 1000 and in the USA $ 1500, in any other part of the world for the equivalent of US $ 1500 within these 12 months, free membership automatically extends for an additional year. Otherwise you may renew your membership for € 30 / $ 40 / £ 25 or 1500 Pro Points for an additional year. In addition, the Kryolan Group gives you Pro Points for every purchase, which you can redeem when buying additional products and services. As a rule, your Pro Point account will be credited with Pro Points for every Euro that you spend. Your collected points remain valid for 3 years. If you have collected Pro Points and do not cash them in before 3 years pass, they lose their value and they cannot be replaced. As a member of the PRO CARD Loyalty Program, we will regularly send you product information. We will keep you informed with the latest news and provide you with pro tips on using our products. What‘s more, the PRO CARD makes it possible for you to attend national and international Kryolan events under special conditions.